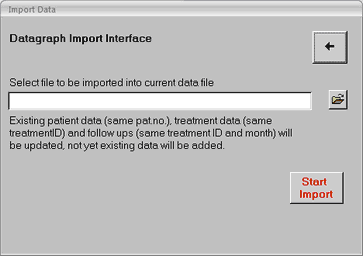 There are two situations where you may need to import data, which is already in a Datagraph-med file format. The first situation is when you have upgraded to a newer version of Datagraph-med and need to convert your older data into the new file format. This is done automatically when you first open your older data file. Datagraph-med will create a new file and convert all your preexisting data. It does not change the old file and crates a new data file with the same name as your previous data file plus the extension of the current version. You may manually edit the data file name after the conversion if you like. Note: If you try to convert very old versions of Datagraph which used the Access .mdb format, you may receive an error message. In this case the automated conversion is not possible. Contact support@datagraph.eu for help in converting your old data files to the current format. 1. - As a precaution against loss of data make backup copies of all data files involved before starting any import attempt and keep on a separate media such an an USB stick for example. 2. - Create a new, empty data file and make the appropriate default settings of laser type, surgeons name etc. 5. - Select the file you want to be imported and then start importing data by clicking the 'start import' button below. Repeat this for the second or third file you want to import. Note: the data which is imported to the current file is either adding patients as new files or adding data to existing patient. Existing patients are identified by their name and treatment ID numbers. If the file to be imported contains different names and treatment ID combinations, you will be prompted to identify these patients or they will not be imported. If tow sites have used similar ID numbers you may have to modify ID Numbers before merging. Contact support@datagraph.eu if you need help with merging data.